by Shannon Clark in Save on Groceries | 4 comments | Contains affiliate links. 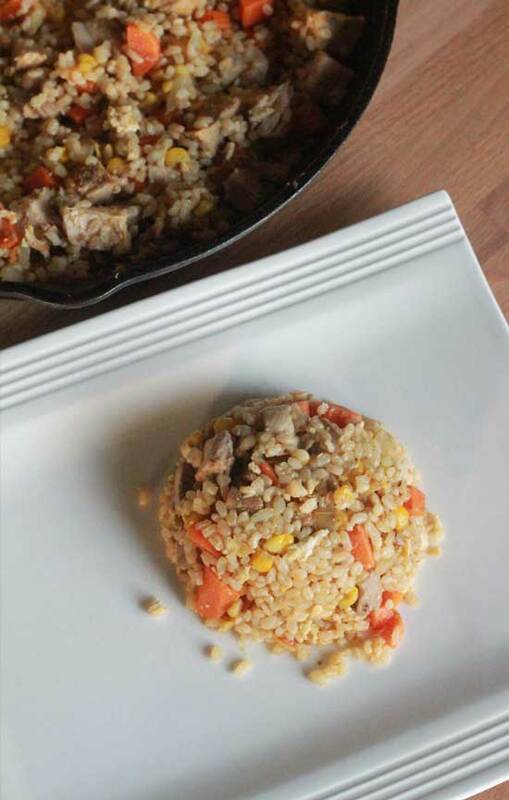 Try this healthy leftover fried rice recipe to add variety and use up leftovers without any complaints of ‘not that again’. This recipe is gluten free and dairy free. The average American family throws away $1,484 worth of food every year! That means one of the very easiest ways you can save money on groceries is to simply use the food that you already have in your home. At the end of each week, my goal is to have no perishable food left in the refrigerator before we head to local farms or the grocery store for the next week’s fresh foods. I’m not perfect at it by any means. I have found, though, that it helps to have a few “use what you have” easy recipes up my sleeve. These are my standby recipes that are so flexible they allow me to use pretty much any kind of leftovers and standard pantry and freezer items I already have. This also really helps at the end of the month, if I don’t have quite enough grocery budget left. I can make it stretch by getting creative with whatever foods I happen to have on hand. 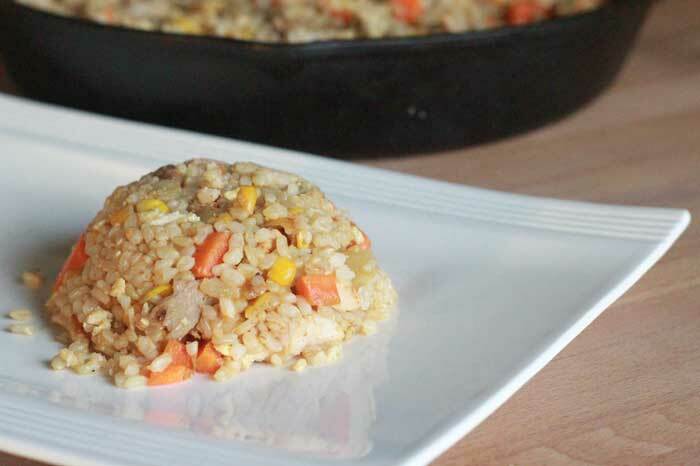 Fried Rice is a perfect use-what-you-have recipe. 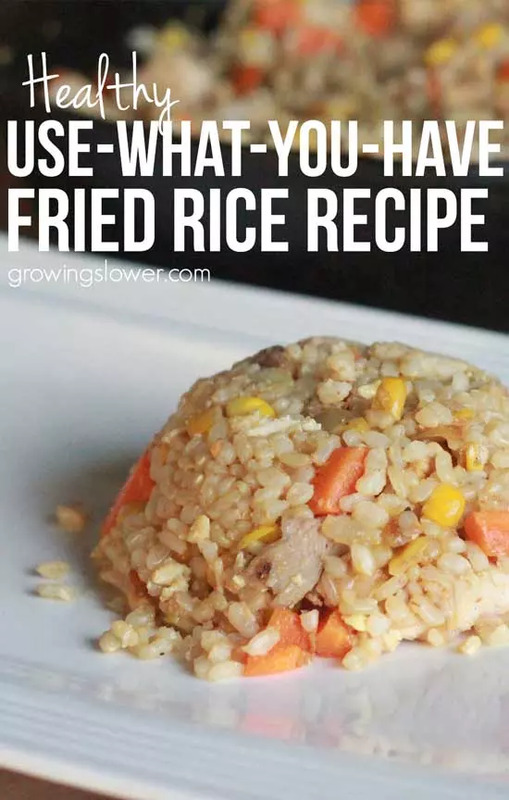 It’s very flexible, as all you really need is some leftover rice, a bit of cooked meat, and any type of vegetables you happen to have on hand. On this occasion, I was using the end of a bag of corn from my freezer, a third of an onion from the fridge, three lonely carrots, and some leftover pork roast. However, you can substitute any vegetables, fresh or frozen that you have available. I often like to add frozen peas to this dish, but I didn’t have any available this time. For the meat, you can use any kind of cooked meat including leftover chicken, pork, beef, or shrimp, or a combination of all of them! That works out perfectly for when you have a bit from each of the last few days meals. Start by gathering your ingredients and chopping the vegetables. 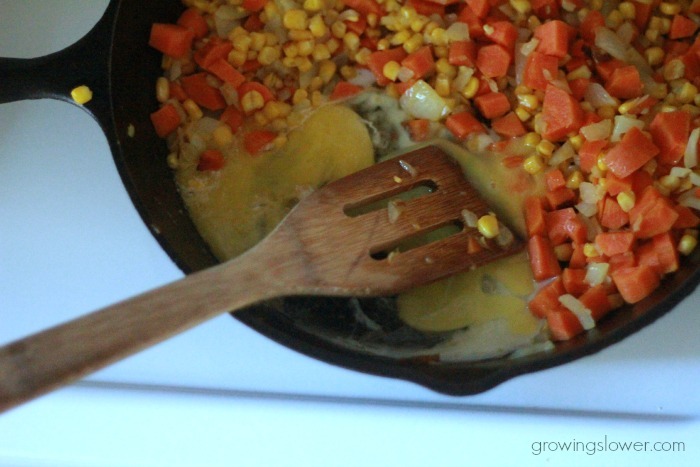 Add butter to a skillet and heat on medium. Then saute the vegetables for about 5 minutes until just starting to soften. Next, form a little hole by moving some of the vegetables out of the way. Add a little extra butter if the food seems to be sticking to the pan too much. Then, crack the eggs into the hole and scramble. 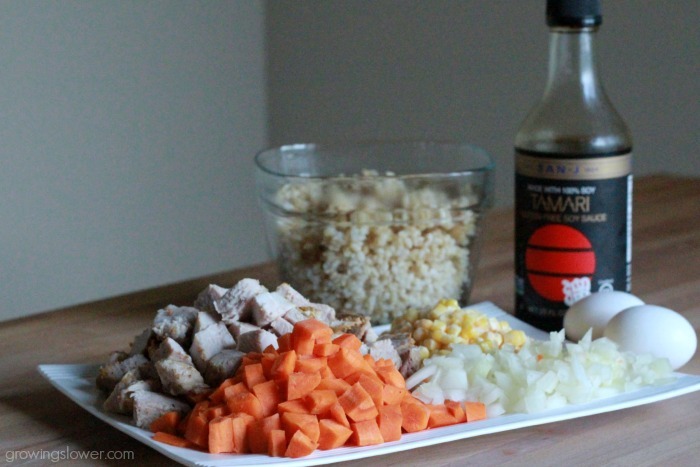 Add the meat and leftover rice to your fried rice, and allow to cook for about 3 minutes until they’re heated. Finally, drizzle the Tamari evenly over the rice and mix thoroughly. 2. Saute vegetables about 5 minutes until just tender. 3. Clear a small area in the pan to cook the eggs. Crack the eggs into it and scramble. 4. Add meat and leftover rice to the pan. Allow to cook until heated, about 3 minutes. 5. Add tamari or soy sauce. Stir to distribute evenly. How do you make sure leftovers don’t go to waste? Share your best tip in the comments! Thanks for sharing your recipes! They would add perfect variety to the fried rice! Love it! When I make rice for dinner, I always try to double the recipe so that I have leftover rice for lunches. 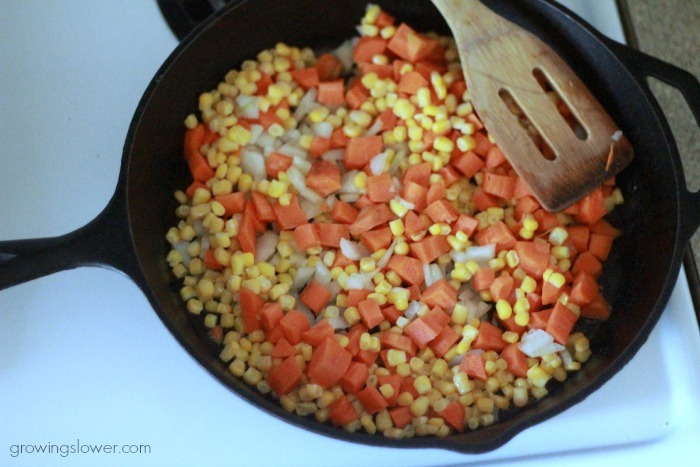 We like ours with peas and carrots, but corn sounds yummy, too. Thanks for the suggestion, Shannon. Another tip is that rice freezes very well. Sometimes I will make a double batch just for the freezer. It can be cooked after being defrosted or straight from the freezer. Great idea Heather! I have rice in my freezer right now, I just keep forgetting to use it!